Performing squats, with no spotters and without the power rack was definitely a hard-hitting task as I tend to lose control sometimes. I knew I had to find something more secure and stable option to perform various exercises. Valor BD-7 Power Rack is bliss to own as it provides versatility, sturdy and secure design with safety pins to put all the weight on. It has ample space to even accommodate bench for different exercises to be carried out. It is certainly very affordable with this array of features provided. 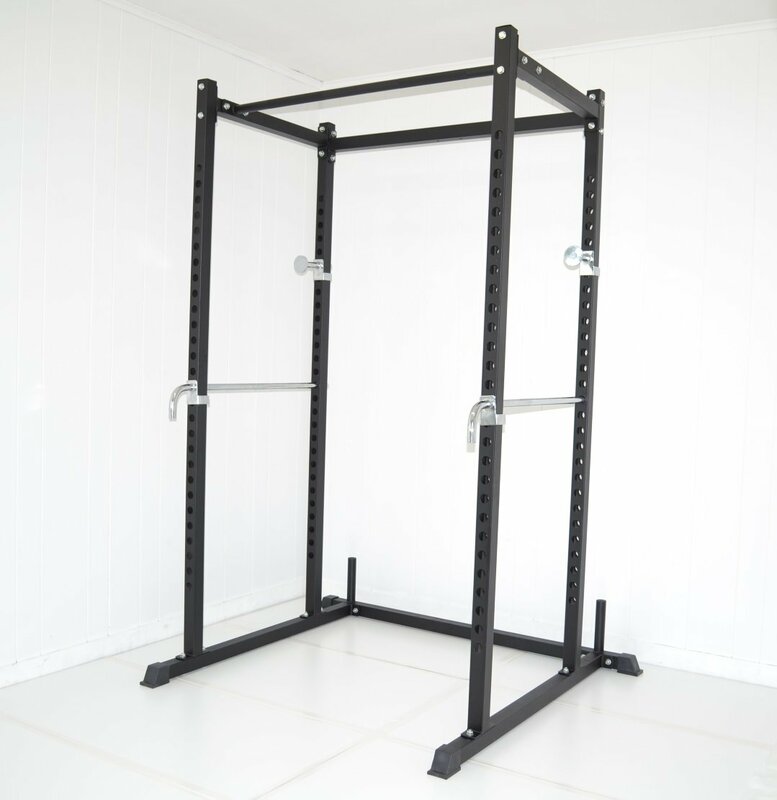 An improvised version of Valor Power rack; Valor BD- 7 is much more secure and sturdy power rack that allows you to perform various exercises, and conveniently justifies all its aims. 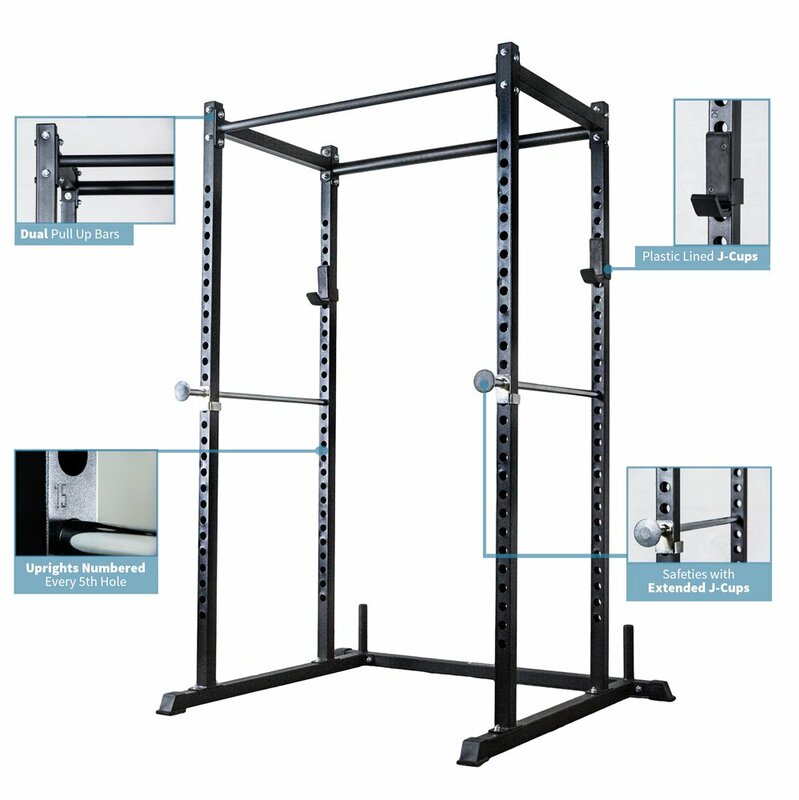 It comes with a Lateral Pull Attachment with high and low pulleys that hike up the number of exercises you can execute with it like Standing row, Triceps pull, Pull ups, seated row, etc.It has two safety catch bars principally framed for a safe training session, even if heavy force has been impacted on the bars. The solid steel bar anchors constructed from robust stainless steel, undoubtedly will offer durability. The Popper pin and the pulleys are backed with 1 year of warranty, the frame is offered with 3 years of exclusive warranty while the cable and pad comes with 2 years of warranty for you to have best after-sales experience. 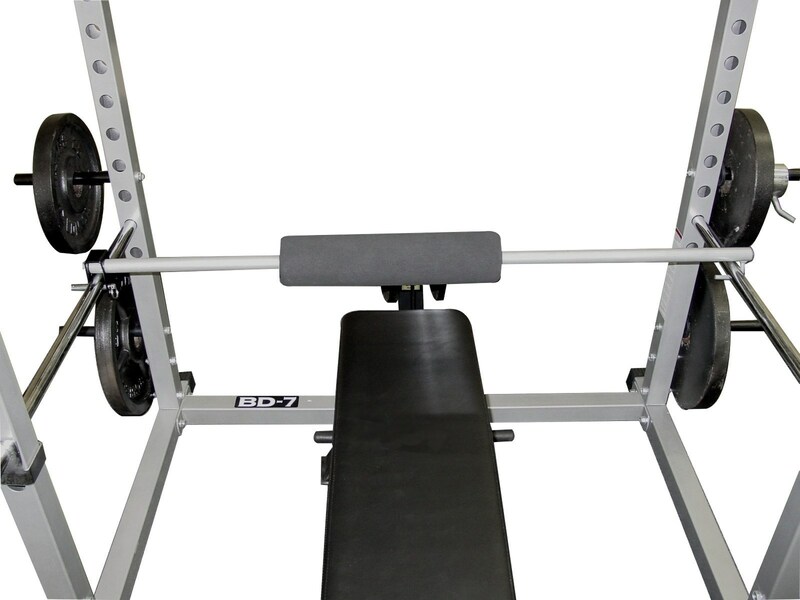 The power rack also includes a lap bar to provide maximum protection while you are performing lateral pulls with a bar pad to be placed on your lap for relief. At the top of the power rack, there is a pull up station with knurled grip finishing at both sides for easy gripping. It measures up to 83” from bottom ground which is ample enough for most of the average people of 350lbs. The rack is built with a 2 x 2 inches of 12-gauge steel frame that offers durability, strength and security which can handle up to 500 lbs. on rack. The steel bars have been spaced about 23.5”in length for you to get caged in and workout. Additionally, it is 43.5” wide from side to side. 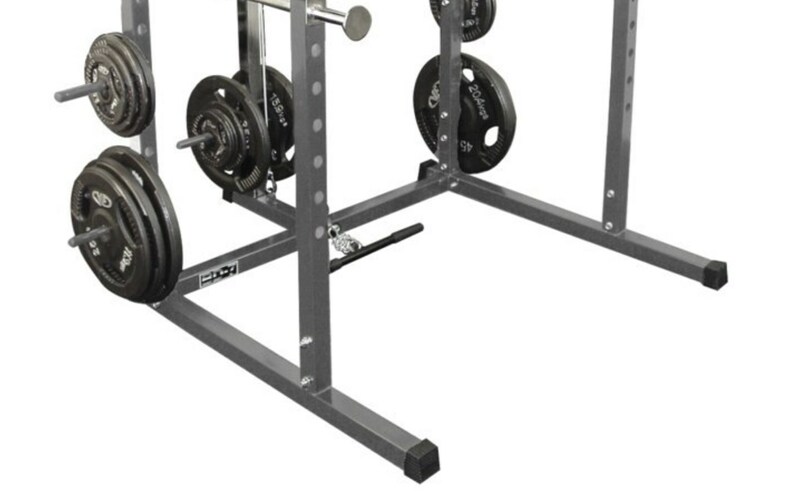 The power rack has a metallic pewter finishing and rubber bottom caps for support with all solid steel chrome equipment. There are 4 plate storage pegs provided at the back of the kit, each side having 2 pegs that can hold 1” to 2” of plates easily at a time. Each peg included here is stretched up to 8 inches long. With all the bar supports, you are free to make adjustments of 17 different positions of heights on them. Each adjustment can be made 17.5” from the bottom ground up to 68” at the top.These supports are all reversible and adaptable. 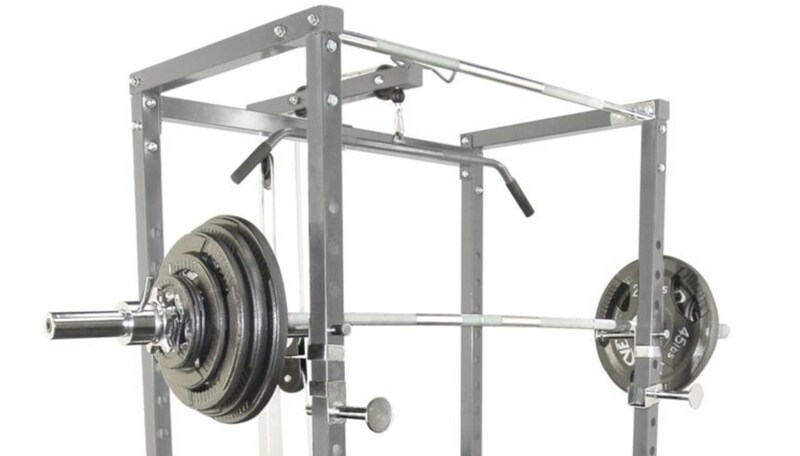 This makes it an ultimate power rack and covers people with different range of heights. 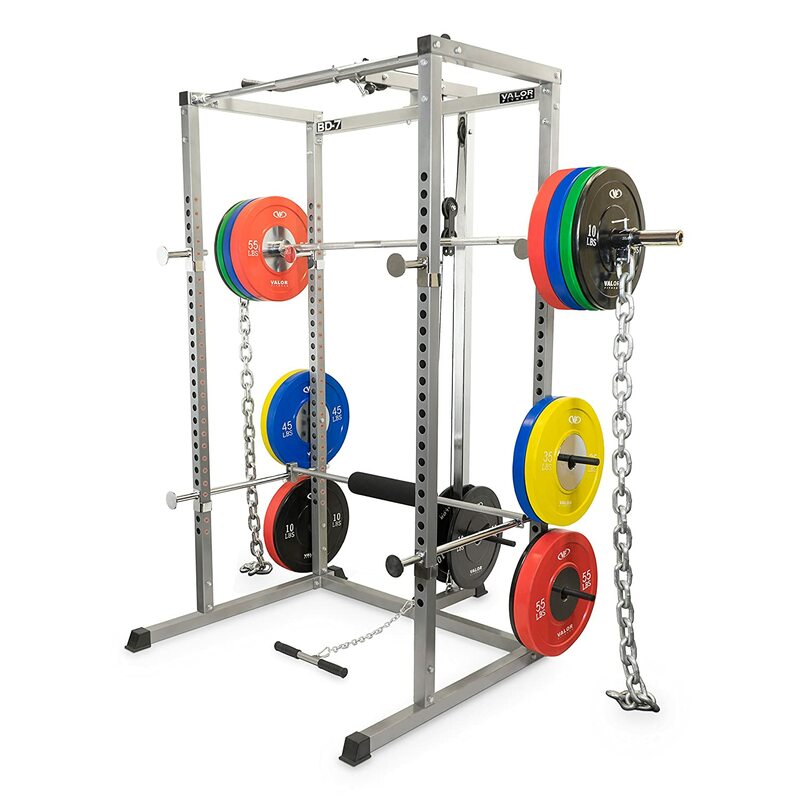 There are 4 adjustable solid bar supports of steel and chrome and two solid squat safety bars of steel all – included in this power rack for you perform various exercises efficiently. Peg holes can also be used for squat bar holder up to 500 lb. and for safety catch bar up to 500lb. There is also a utility bar which is secured with foam for curls or other attachments to be added. 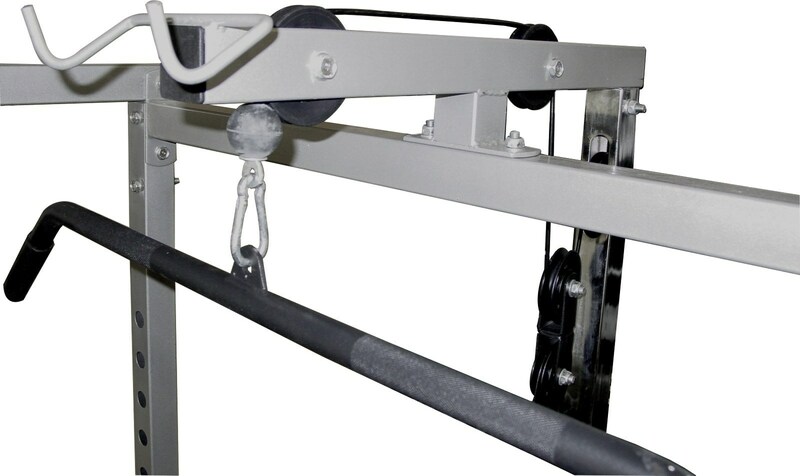 The Lat Pull down Attachment with cable high and low pulley mechanism makes it from the unique power racks available out there, allowing you to perform all the isolation exercises as well. The high cable pulley can also be used with the different accessories as cantilever clip is provided for rapid adjustment. The low cable pulley allows you to perform seated rows, bicep curls, etc. Maximum weight that low cable pulley can handle is 250lbs. Every Lat pull down equipment needs to have a pad accessory to secure you in place while performing pull downs. Valor power rack offers a horizontal bar at the back side with a pad placed in the center to hold you in place while you are performing heavy pull downs. You just need to adjust it upon your thighs when you are seated, and you are good to go. All these features make it great equipment whether be it for your home gym or professional fitness centers. Who does Valor BD-7 Power Rack Compete with? Sturdy just like Valor BD-7, Rep Fitness offers this Rep Power Rack that is total 82” long with 700lbs. weight capacity. It has 11 gauge 2 x 2 inches of steel frame with two 1.25” and 2” pull up bars that can handle 400lbs and on the front part of the equipment there are extra bar holders provided for safety purposes. There are numbered uprights included as well. Although, Valor power rack has more safety features than this one. There are weight horns at the back of the rack to provide security and stableness. The power rack can handle up to 400lbs. of dip attachment as well as it has a padded dip handles with adjustable width for your comfort while exercising. Best for advanced bodybuilders as they can choose their own attachments from the list provided, cost varies accordingly. You can buy it here. It offers 28 different positions to be adjusted according to different heights of users and type of exercises preferred as it has 28 holes with 2 inch spacing. It has a chin up bar on top with knurl finish for fine grip, plate holders at the back, chrome made short pegs to hold bars, detachable J-hooks, long bars for safe exercising, dip and lat attachments for adding up to the number of exercises to be performed. This power rack is best for medium duty use with 800lbs. of capacity, beginners can try it out. It has 10 years of warranty for frame. You can check it out here or read the full review. The chin up and dip bars all-included in this power rack makes it perfect to perform different presses and dips exercises with 400lbs. of handling capacity. It is compatible with the Powertec high/low lat tower pulley system as well for user suitability to perform additional exercises. It has an impressive lifetime of frame warranty, 1 year for pads/grips and 2 years warranty on components. It has adjustable spotter bars for your protection. People looking for something compact to fit in their garages or limited spaced rooms can buy this power rack. 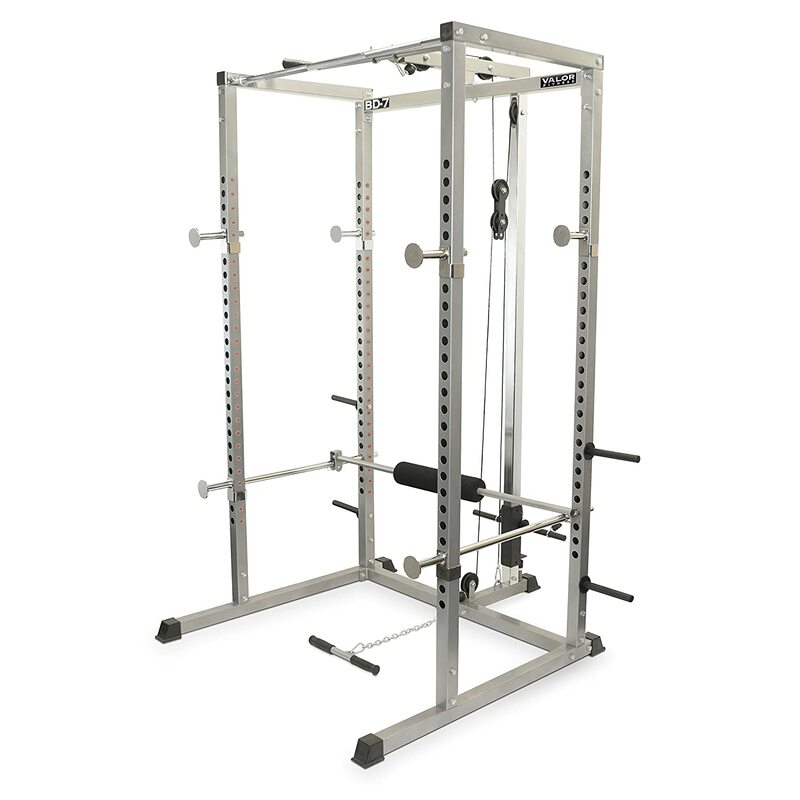 If you would love to have a sturdy power rack with full accessible and significant features added, then definitely go for Valor BD-7 with very reasonable price. 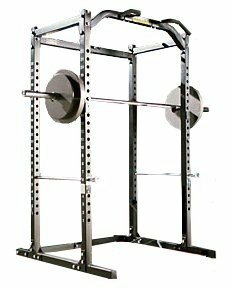 It offers some great build and aspects all at unbelievably affordable price which makes it really preferable Power rack than others. The Lat Pull down Attachment provided is certainly a gratuity, unlike in other power racks; this feature is a standard part of the product not just an add-on making it a winner. Also, a pull up bar at the top is a great feature included.